Friedrich Nietzsche (1844–1900) was a German philologist, philosopher, cultural critic, poet and composer. 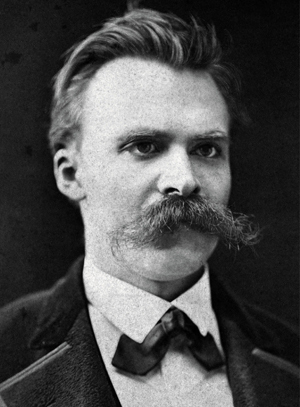 He wrote several critical texts on religion, morality, contemporary culture, philosophy and science, displaying a fondness for metaphor, irony and aphorism.Nietzsche's key ideas include the Apollonian/Dionysian dichotomy, perspectivism, the Will to Power, the Death of God, the Übermensch and eternal recurrence. One of the key tenets of his philosophy is the concept of life-affirmation which embraces the realities of the world in which we live over the idea of a world beyond. It further champions the creative powers of the individual to strive beyond social, cultural, and moral contexts. His radical questioning of the value and objectivity of truth has been the focus of extensive commentary, and his influence remains substantial, particularly in the continental philosophical schools of existentialism, post-modernism, and post-structuralism. His ideas of the individual and transcendence beyond structure and context have had a profound impact on late-twentieth and early-twenty-first century thinkers, who have used these concepts as points of departure in the development of their philosophies. the roles of curator and editor of Nietzsche's manuscripts. Förster-Nietzsche was married to a prominent German nationalist and anti-Semite, Bernhard Förster, and reworked Nietzsche's unpublished writings to fit her own ideology, often in ways contrary to Nietzsche's stated opinions, which were strongly and explicitly opposed to anti-Semitism and nationalism. Through Förster-Nietzsche's editions, Nietzsche's name became associated with German militarism and Nazism, although later twentieth-century scholars have counteracted this conception of his ideas. book, filled with Kantian and Schopenhauerian formulas that were inherently at odds with the new valuations he was trying to express.Nietzsche, having by this time absorbed the German romanticist, and specifically Schopenhauerian view that non-rational forces reside at the foundation of all creativity and of reality itself, identifies a strongly instinctual, wild, amoral, "Dionysian" energy within pre-Socratic Greek culture as an essentially creative and healthy force. Surveying the history of Western culture since the time of the Greeks, Nietzsche laments over how this Dionysian, creative energy had been submerged and weakened as it became overshadowed by the "Apollonian" forces of logical order and stiff sobriety. He concludes that European culture since the time of Socrates has remained one-sidedly Apollonian, bottled-up, and relatively unhealthy. 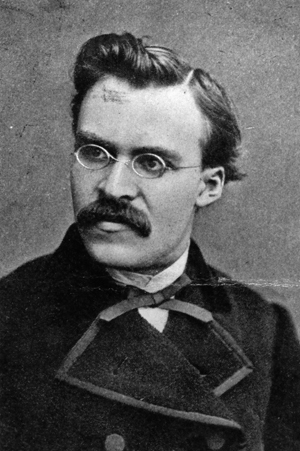 In part because of Ritschl's support, Nietzsche received a remarkable offer to become professor of classical philology at the University of Basel in Switzerland. He was only 24 years old and had neither completed his doctorate nor received a teaching certificate. Despite the fact that the offer came at a time when he was considering giving up philology for science, he accepted. To this day, Nietzsche is still among the youngest of the tenured classics professors on record. Before moving to Basel, Nietzsche renounced his Prussian citizenship: for the rest of his life he remained officially stateless. Nevertheless, Nietzsche served in the Prussian forces during the Franco-Prussian War (1870-1871) as a medical orderly. In his short time in the military, he experienced much and witnessed the traumatic effects of battle. He also contracted diphtheria and dysentery. Walter Kaufmann speculates that he might also have contracted syphilis along with his other infections at this time. On returning to Basel in 1870, Nietzsche observed the establishment of the German Empire and Otto von Bismarck's subsequent policies as an outsider and with a degree of skepticism regarding their genuineness. His inaugural lecture at the university was Homer and Classical Philology. Nietzsche also met Franz Overbeck, a professor of theology who remained his friend throughout his life. Afrikan Spir, a little-known Russian philosopher responsible for Thought and Reality (1873), and Nietzsche's colleague -- the famed historian Jacob Burckhardt -- whose lectures Nietzsche frequently attended, began to exercise significant influence on him during this time. Living off his pension from Basel and aid from friends, Nietzsche travelled frequently to find climates more conducive to his health and lived until 1889 as an independent author in different cities. He spent many summers in Sils Maria near St. Moritz in Switzerland. He spent his winters in the Italian cities of Genoa, Rapallo, and Turin and the French city of Nice. In 1881, when France occupied Tunisia, he planned to travel to Tunis to view Europe from the outside but later abandoned that idea, probably for health reasons. Nietzsche occasionally returned to Naumburg to visit his family, and, especially during this time, he and his sister had repeated periods of conflict and reconciliation. While in Genoa, Nietzsche's failing eyesight prompted him to explore the use of typewriters as a means of continuing to write. He is known to have tried using the Hansen Writing Ball, a contemporary typewriter device. In the end, a past student of his, Peter Gast, became a sort of private secretary to Nietzsche. In 1876, Gast transcribed the crabbed, nearly illegible handwriting of Nietzsche for the first time with Richard Wagner in Bayreuth (in northern Bavaria). He subsequently transcribed and proofread the galleys for almost all of Nietzsche's work from then on. On at least one occasion -- on February 23, 1880 -- the usually broke Gast received 200 marks from their mutual friend, Paul Rée. Gast was one of the very few friends Nietzsche allowed to criticize him. In responding most enthusiastically to Zarathustra, Gast did feel it necessary to point out that what were described as "superfluous" people were in fact quite necessary. He went on to list the number of people Epicurus, for example, had to rely on even to supply his simple diet of goat cheese. Tautenburg in Thuringia, often with Nietzsche's sister Elisabeth as a chaperone. Nietzsche, however, regarded Salomé less as an equal partner than as a gifted student. Salomé reports that he asked her to marry him and that she refused, though the reliability of her reports of events has come into question. Nietzsche's relationship with Rée and Salomé broke up in the winter of 1882-83, partially because of intrigues conducted by Elisabeth. Amidst renewed bouts of illness, living in near-isolation after a falling out with his mother and sister regarding Salomé, Nietzsche fled to Rapallo. Here he wrote the first part of Thus Spoke Zarathustra in only ten days. 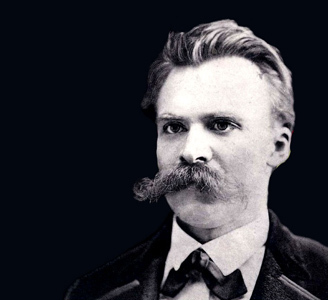 By 1882 Nietzsche was taking huge doses of opium but was still having trouble sleeping. In 1883, while staying in Nice, he was writing out his own prescriptions for the sedative chloral hydrate, signing them Dr. Nietzsche. After severing his philosophical ties with Schopenhauer -- who was long dead and never met Nietzsche -- and his social ties with Wagner, Nietzsche had few remaining friends. Now, with the new style of Zarathustra, his work became even more alienating and the market received it only to the degree required by politeness. Nietzsche recognized this and maintained his solitude, though he often complained about it. His books remained largely unsold. In 1885, he printed only 40 copies of the fourth part of Zarathustra and distributed only a fraction of these among close friends, including Helene von Druskowitz. In 1883 he tried and failed to obtain a lecturing post at the University of Leipzig. It was made clear to him that, in view of the attitude towards Christianity and the concept of God expressed in Zarathustra, he had become effectively unemployable by any German university. The subsequent feelings of revenge and resentment embittered him: And hence my rage since I have grasped in the broadest possible sense what wretched means -- the depreciation of my good name, my character, and my aims -- suffice to take from me the trust of, and there with the possibility of obtaining, pupils. On 3 January 1889, Nietzsche suffered a mental collapse. Two policemen approached him after he caused a public disturbance in the streets of Turin. What happened remains unknown, but an often-repeated tale from shortly after his death states that Nietzsche witnessed the flogging of a horse at the other end of the Piazza Carlo Alberto, ran to the horse, threw his arms up around its neck to protect it, and then collapsed to the ground. In the following few days, Nietzsche sent short writings -- known as the Wahnbriefe (Madness Letters) -- to a number of friends including Cosima Wagner and Jacob Burckhardt. Most of them were signed Dionysos. To his former colleague Burckhardt,Nietzsche wrote: I have had Caiaphas put in fetters. Also, last year I was crucified by the German doctors in a very drawn-out manner. Wilhelm, Bismarck, and all anti-Semites abolished. Additionally, he commanded the German emperor to go to Rome to be shot and summoned the European powers to take military action against Germany.In 1898 and 1899 Nietzsche suffered at least two strokes which partially paralyzed him, leaving him unable to speak or walk. He likely suffered from clinical hemiparesis/hemiplegia on the left side of his body by 1899. After contracting pneumonia in mid-August 1900, he had another stroke during the night of 24-25 August and died at about Noon on 25 August. Gast gave his funeral oration, proclaiming: Holy be your name to all future generations! Nietzsche had written in Ecce Homo (at that point still unpublished) of his fear that one day his name would be regarded as holy. Elisabeth Förster-Nietzsche compiled The Will to Powerfrom Nietzsche's unpublished notebooks and published it posthumously. Because his sister arranged the book based on her own conflation of several of Nietzsche's early outlines and took great liberties with the material, the scholarly consensus has been that it does not reflect Nietzsche's intent.